Truly indispensable for optimizing the qualities of Sennelier Extra-Fine Acrylique Paints, these acrylic lacquers create a wide variety of effects. 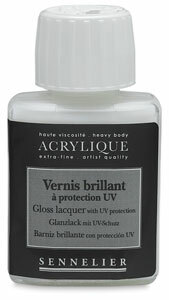 Apply lacquers to dry paintings for protection against harmful ultraviolet light and scratches. 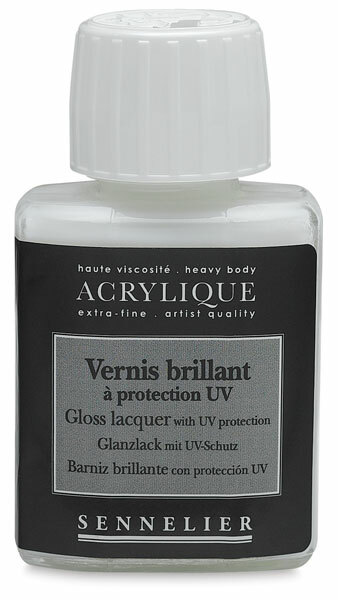 Gloss Lacquer with UV Protection — Apply with a paintbrush or brush to completely dry surfaces to create a glossy protective film that resists ultraviolet light and scratches. Use in its original form, dilute it with water, or mix with Matte Lacquer to obtain a custom satin finish. Intended for interior or exterior use, it is irreversible, non-yellowing, water-resistant and transparent. Matte Lacquer with UV Protection — Apply with a paintbrush or brush to completely dry surfaces to create a protective film that keeps colors bright and resists ultraviolet light and scratches. Use in its original form, dilute it with water, or mix with Gloss Lacquer to obtain a custom satin finish. Intended for interior or exterior use, it is irreversible, non-yellowing, water-resistant, and dries translucent.